Three people have been killed and several wounded in two explosions in the Kenyan coastal city of Mombasa, police say. In the deadliest attack, a grenade was reportedly thrown in a bus that had just arrived from Nairobi. The other blast happened at a bar near a hotel in the Nyali beach area. There are no reports of casualties there. 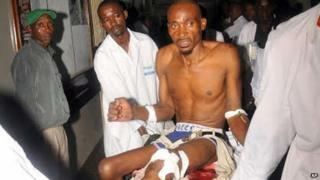 Kenya has been hit by a spate of attacks blamed by the government on Somali Islamist militants. The al-Qaeda-linked group al-Shabab has carried out several attacks in Kenya since 2011, when Kenya sent troops into Somalia to battle it. No-one has yet claimed responsibility for Saturday's blasts. The first blast is believed to have occurred after a grenade was thrown in a Nairobi-Mombasa bus that had just arrived in the busy Mwembe Tayari transport terminal, killing three people and wounding at least four others. The second explosion took place at a beach bar near the Nayali Reef Hotel, after a device was left in a plastic bag in the washroom. It is thought that a third attack was planned for a nearby cinema complex but was unsuccessful. All three incidents happened within minutes of each other, BBC correspondent Mohamud Ali reports from Nairobi. Tensions have been rising in Mombasa in recent months, with authorities accusing Islamists of radicalising local youths. Al-Shabab was blamed for an attack on a church in Mombasa in March that killed six people. Shortly afterwards, a radical Muslim cleric alleged to have acted as a recruiter for al-Shabab was shot dead near Mombasa, prompting riots in the city. Kenya has vowed to halt attacks by militant Islamists and arrested some 2,000 people in the capital last month.